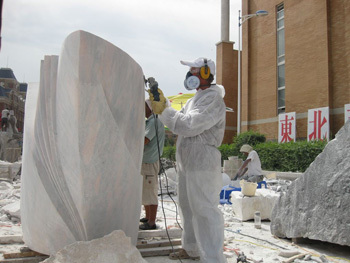 The artisans have spent the past 2 weeks working on the two massive blocks of red marble. Now it is my turn to examine the work, make corrections where necessary and finish the work. I relished the opportunity over he past few days of working on the stones with my angle grinder. I caused a bit of a stir by kitting myself out with all my personal protective gear. I even slipped on a light weight pair of overalls to protect me from all the fine marble dust. But the artisans had another question for me. How is the second block to be lifted into its final position? Normally the guy with the mobile crane would attach straps underneath the stone and lower it into place. 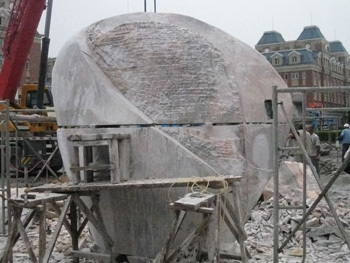 No straps can be used on the final lift because they would be trapped between the two blocks of marble. And the rounded shape of the top block is such that the straps may slide up and lose the load. What to do? One way would be to drill 4 holes in the top block and insert metal rods. The straps would then wrap around the metal rods and the lift could be undertaken safely. 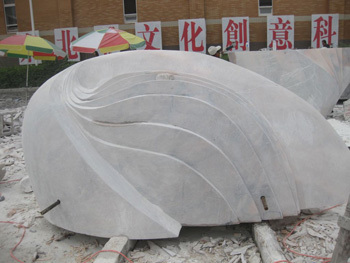 The drilling and lifting may put undue pressure on the stone. To avoid drilling an alternative would be to cut 2 shallow channels in the base of the top stone to accommodate the straps which could be removed after the lift was completed. This sounds a good idea but relies on the crane driver repositioning the top block on its side risking damage to the thinnest part of the block. On balance we decided to go with the drilling solution and filling in the holes left by the metal rods once the sculpture is in position. Although the marble blocks I needed were over a week late in arriving at the work site, the work has progressed well. At any one time there would be up to 4 artisans working on the blocks. The artisans have already moved on to assist other sculptors complete their designs. I have great admiration for the team of artisans that worked on my sculpture; they have been instrument in helping me realise a dream I had when I created the first Cloudstone that it would look great if it were 3 metres high. In fact my son Alexander created an image of my sculpture 3 metres high using the magic of Photoshop. And so it has come to pass…well almost.